On 6 April 1994, the President of Rwanda, a Hutu, was killed in a missile attack on his aircraft. This led to the murder of the Prime Minister who was a Tutsi - and to the failure of the UN peacekeeping mission. Thereupon, an organised massacre of the minority Tutsi community and moderate Hutus started. 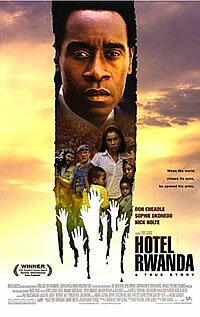 10 years later, the film "Hotel Rwanda" depicts the true-life story of Paul Rusesabagina, a hotel manager who housed over a thousand Tutsis refugees during their struggle against the Hutu militia. This tragic genocide is also topic of essays and books, here some recommended reads.